Niah National Park is situated about 109 km from Miri (2 hours) and 131km from Bintulu (3 hours). Sarawak, is Niah National Park, spreading over 3,102 hectares of peat swamp, dipterocarp forests, and gigantic limestone outcrops. Bird life in the park is represented by bulbuls, tailor birds, trogons, crested wood partridges, horn-bills, and eagle owls, Other inhabitants of the park include Raja Brooke butterflies, flying lizards, and long tailed macaques. Gu nung Subis, 394 meters above sea level, dominates the landscape. 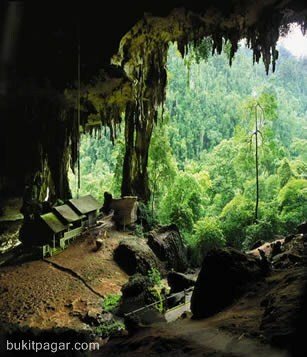 The Great Cave is Borneo's most important archaeological site as in 1958, relics of prehistoric man were discovered such as bones, stone tools, and shell ornaments. You can see evidence of prehistoric inhabitants in the Painted Cave where human figures drawn on the wall watch over grave sites where the dead were laid in boat-shaped coffins. Traders Cave comes first just before the main cave - it is a long low cave with old trading stalls made out of Belian wood (ironwood), some of them nearly 100 years old. It is basically a circular tour through the cave system and then head back to entrance, unless you want an extra hour's walk to the Painted Cave, which is interesting but adds a lot of walking! The paintings were believed to be over 1,000 years old and together with these paintings, there were some small canoe-looking ships of the dead. These are believed to serve as coffins and the Painted Cave as in fact a cemetery. Visit Rumah Chang Longhouse on the way back if you wish - it is now re-built and thoroughly modernised! They even park their cars underneath nowadays, where the chickens and pigs used to live!